The intensity in the room at a Faber Academy Writing a Novel class is something to be experienced. The writers gathered there have committed themselves to a challenge that so many would-be novelists have thought about, longed to try, even attempted, but never achieved. Week after week these Faber writers turn up to learn and practise the craft, to engage with fresh ideas, to look ever deeper into the heart of their novels, to write, rewrite and restructure, and press on toward that elusive goal, the completed manuscript. It is our privilege to be with them as their work grows and develops. Writing a novel is not an arbitrary choice of hobby, like taking a life drawing class for fun or learning to build a planter box. Writing a novel asks of writers that they be willing to give up other things in their lives to allow the work in. They know it will take time, so much time, and they know there will be failures and those failures must be righted or abandoned and more work must be done. The novel becomes an integral part of the day, lurking at the edge of the mind. It flares in the imagination when the writer is performing mundane tasks, it startles the dreamer awake, it frustrates at every turn. The true writer goes back and works at it again. That is the persistence and determination we have seen in the Faber room. But a novel is more than hard labour and persistence. When you ask writers why they write, the answer lies in what has been written. A novel transmutes the clamorous chaos of life into a singular vision that could only have been imagined by one person and fashioned with precisely chosen words. In the process of writing, finding the way to express this vision can be the most frustrating challenge of all. All writers carry a cargo of doubt, of fear, of too much awareness of the world and how it might apprehend what they create. Yet they stow that cargo and write on. Our Faber students wrote on. As we travelled with our writers in 2017, the way was lit on many occasions by our guest speakers. Writers, publishers, agents and performance coaches were generous enough to give their time and share their expertise. We were joined by Mandy Brett, Steven Amsterdam, Aviva Tuffield, Emily Bitto, Nicole Muir, Sally Bird, James Bradley, Margo Lanagan, Catherine Drayton, Ross Grayson-Bell, Paul Goddard and Annette Barlow. Each guest offered a unique insight into the mechanics, the pleasures and the pitfalls of writing and publishing. Thank you for your inspiration. We are also grateful for the warm, expert and efficient administration of the Faber Writing Academy team, April Murdoch, Sarah Menary and Susie Lenehan. The ministering angels, Elise Jones, Matariki Williams and Tali Heyman-Griffiths, welcomed us each session and made the Faber classrooms feel like they belonged to us alone. When the end of the Faber course draws near, there is often more laughter in the room. Partly the laughter signifies a relief that yes, we have done this: we are writers, we have written, we will keep writing. Perhaps it is also a dawning acknowledgement that even though this writing business requires discipline and great effort, it offers a joy in that moment of understanding, that perfect sentence, that flash of illumination, which cannot be found anywhere else. Borges once said, ‘A writer should always be judged by his or her best pages.’ We commend to you the best pages of the 2017 Faber Academy students. We hope you will find as much enjoyment and delight in reading their stories as we have. 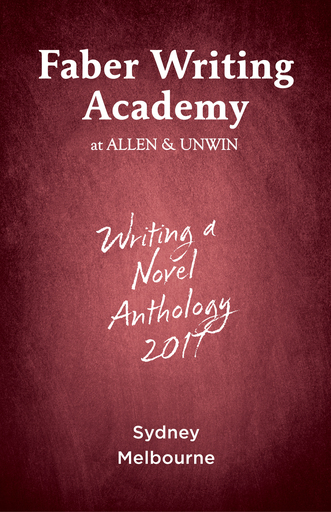 And congratulations to our hardworking writers for the talent and energy that grace the anthology you hold in your hands today.